Whether you are stepping out downtown or down the aisle, our make-up artist will create a look that charms and flatters. 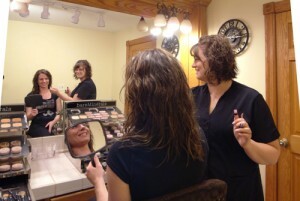 We use MAC Cosmetics, and other lines of mineral makeup. Customized to fit your needs. Receive advice from our professionals on skin care and makeup application. Perfect for teens who want to establish healthy skin care habits. Ideal for those who desire an updated look.